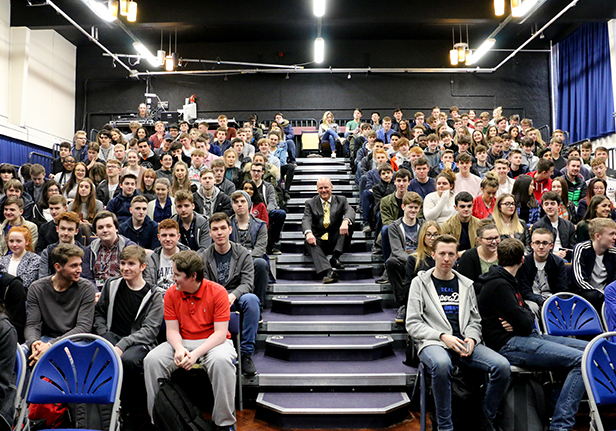 Over 250 students packed out Winstanley College’s theatre to hear RSA Insurance Group CEO and, Stephen Hester, talk about his exciting career in the finance world. Stephen spoke about his childhood growing up in rural Yorkshire and studying at a local comprehensive school where few students went on to university. He decided at an early age that he wanted to fulfil his true potential and he set his sights on a place at Oxford University. He achieved his goal, graduating with a First Class Honours Degree in Philosophy, Politics and Economics from Lady Margaret Hall College, Oxford. From university he began a career in finance, working in a number of roles, before reaching the dizzy heights of CEO for the Royal Bank of Scotland and following this, his current role as CEO at the RSA Group. Stephen also told of his enjoyment of working with young people and encouraging others from state school backgrounds to aim high. He was happy to answer a range of questions from the captivated audience, many of whom were Business and Economics students with hopes to follow similar career paths.